Siena's historic and beautiful architecture often feels like a stage set --- and in the summer months it literally is! This is when artists, musicians, poets, and performers of all types flood into town to display their talents in churches, palaces, oratories and piazzas. 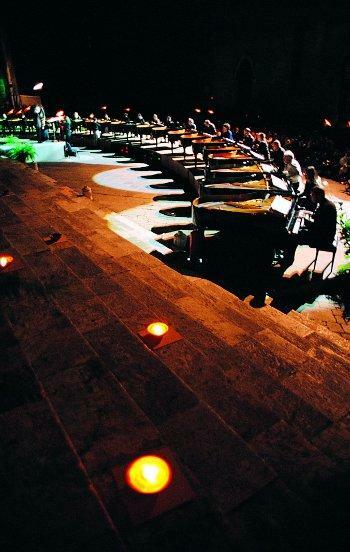 One of the most well established yearly traditions is Siena Jazz, based in the Medici Fortress. Founded as a didactic organization in which jazz techniques, styles and approaches are shared and practiced, it features performances by internationally renown musicians in a variety of locations all around the city. For classical music, the Palazzo Chigi-Saracini in via di Citta' houses its own Accademia Musicale Chigiana, with rigorous, high level courses offered to a select group of participants. Concerts are given in the palace's beautifully appointed 18th century rococo-style concert hall, a real treat for the eyes and ears. For theatrical events Siena has a variety of venues: the Piccolo Teatro in via Montanini, the Teatro dei Rozzi in Piazza Indipendenza and the Teatro dei Rinnovati in the Palazzo Pubblico.